I came in here because I fancied some decent food and this is a good place for that, I did not not note all the beers on offer but most were from the Fullers/Dark Star range. Although a busy Thursday evening the service was good (and so was the Steak & Ale Pie). Dark Star - American Pale Ale 4.70 Absolutely perfect. I could not fault this in any way. A swift visit. Sat in the side room overlooking the Kings Cross trains. Evening visit whilst waiting for a train from nearby St. Pancras. Not as busy as I expected and Fullers/Dark Star beers dominating the beer range on offer. Good service as usual in here. I have not listed all the beers that were on offer. Mid evening visit. A true warren of a place to explore. Castle Rock - Session IPA 2.0v1.7 Simcoe/Ahtanum/Columbus 4.00 Hazy and very pale. White pepper. Hint of roses. Thursday evening and very busy but with a commuter crowd rather than the people with suitcases earlier in the day. I was served immediately which seems to be the norm in here. The list of beers below is done from memory and I have probably missed a few. Fuller's - London Pride 4.10 Oh if only Pride was always as good as this. Those nice people at Fullers sent me a voucher code for a free pint, I don't know why but I am not complaining. This was just after mid-day and the pub was very busy with a good mix of customers and plenty of suit cases. Good service here as usual. I decided it was more comfortable to sit in here than in the Eurostar departure lounge, and then nearly missed my train because of very slow-moving security queues. Fuller's - Damson Porter 4.60 A very nice, rich and fruity Porter. Not sweet. Evening until close. Apart from the Castle Rock all Fullers beers tonight. Friday evening and busy but I was served immediately, well worth missing a train for. Adnams - Great Get Together 4.20 Not Tried I am not sure who brews this, it is a collaboration brew involving Adnams, Arkells, Cliff Quay, Elgoods, Fullers, Harviestoun, Holts, Joules, Lees, Marstons, Palmers, St. Austell, Theakston, Thornbridge and Woodfordes. I do not know its true provenance. The pub is found in King's Cross / St Pancras, Central London, N1C 4AP. 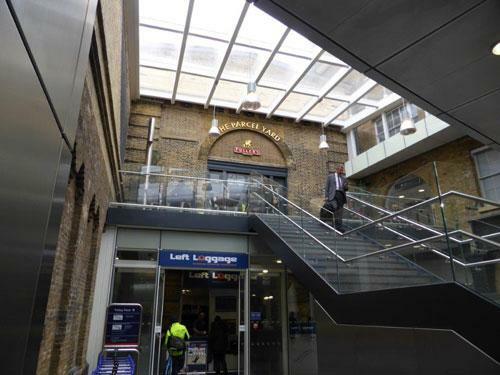 A new pub, opened on 19 March 2012, in the refurbished King's Cross railway station. The pub is on two floors, the lower one being the main drinking area, it has a number of separate rooms, and a large airy central area. The walls are adorned with old Fuller's advertisements amongst items of railway interest. The lower bar counter has 12 handpumps in 2 banks, each of 6. We have visited this pub 55 times, seen 103 different beers and tried 37 of them.